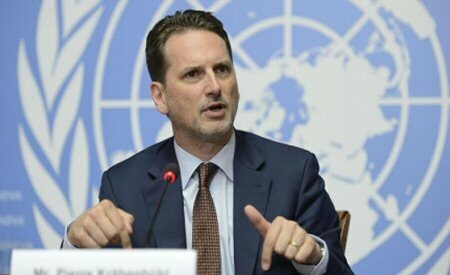 UNRWA Commissioner-General Pierre Krähenbühl said that his agency will overcome US obstacles after Trump’s decision to suspend aid to the Palestinian refugees in the Gaza Strip, Jerusalem, the West Bank, Jordan, Lebanon and Syria. Krähenbühl stressed, in a press release to Palestinians, that UNRWA will continue to work with all its energy and creativity in order to continue to meet the needs of the Palestinian refugees and maintain the basic services they provide. “All of our staff will be in their workplaces, our facilities will remain open and secure. We must stick to our goal in the strongest possible ways,” he said, according to Al Ray Palestinian Media Agency. Krähenbühl deeply regretted the US decision and the speeches that accompanied the decision. “With all confidence and firm determination, we will continue in Gaza, East Jerusalem, the West Bank, Jordan, Lebanon and Syria, and I want to make sure that our agents will overcome these obstacles,” he said.